Strutmasters 2000-2006 Chevrolet Suburban 1500 4 Wheel Suspension Conversion Kit is the perfect solution to your active suspension problems. Designed to be very affordable, you can convert your air shocks and electronic shocks to use passive shocks and coil springs for less than the price of replacing just ONE Original Equipment part. Fits Both 2WD and 4WD Models of the 1500 Series. For best results getting the suspension warning light off, we recommend converting all four wheels of the vehicle at the same time. 2000-2006 Chevrolet Suburban 1500 4 Wheel Air Suspension Conversion Kit (GC14F) is the perfect solution to your air suspension problems. Designed to be very affordable, you can convert your air suspension to use standard. The 2000-2006 Chevy Suburban 1500 active suspension system is made up air shocks, electronic shocks and a wide array of assorted parts that are expensive to repair. If just one component is not working in sync with the others, the entire suspension system can't function properly. Years ago, we found ourselves in this tough spot with a huge repair bill and no alternatives. That's why we became The Suspension Experts because we knew there must be a better solution. Our suspension conversion kit offers an affordable direct replacement of your air and electronic shocks without sacrificing ride quality. Our kit includes two passive rear shocks, two high quality rear Eibach coil springs, and two passive front shocks with detailed instructions so you can install the kit in about one hour per wheel. If you have some mechanical skill you can install our kit yourself. If you or your mechanic have questions, our technical support team is here to help! 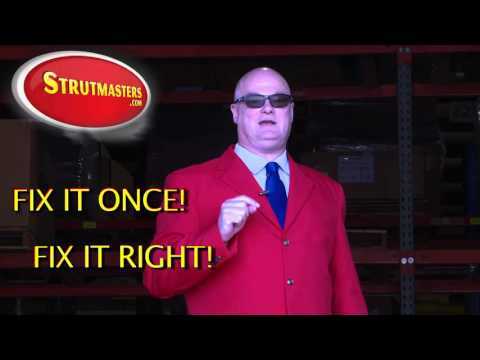 Strutmasters saves you time, frustration, and a ton of money. It's no wonder most of our satisfied customers chose our conversion kit. You have three options when faced with failure of your active suspension: Repairing the suspension system with Original Equipment parts at a GM dealer; installing aftermarket replacement suspension parts on your Suburban 1500 piece by piece; or getting rid of your headaches for good by installing a Strutmasters suspension conversion kit today. When you choose a Strutmasters kit, your wallet will thank you! Like its sister vehicle the Tahoe, the 2000-2006 Chevrolet Suburban often has issues with its sway bar and bushings as well as its compressor. Many vehicle owners don‚Äôt know that small things like your ball joints and bushings should be inspected every 60k miles and that it‚Äôs often the cause suspension noises and poor handling. It is advisable to replace all these components, if bad, when making repairs to the major pieces of your suspension. Are you noticing that your compressor seems loud and runs often? I so, you likely have a leak in your air suspension system that‚Äôs causing the compressor to work overtime. You may also notice that if you are towing or hauling a heavy load that the compressor raises the suspension at the start but after a distance your Suburban is riding on the tires. This is a clear indication of a leak because the Auto Ride system is only designed to run if the vehicle is in park, so as not to interfere with driving during bumpy conditions. If you‚Äôre noticing any symptoms of a failing air suspension you‚Äôll want to have them repaired immediately before total suspension failure occurs. = TOTAL: Over $1,638 (and that doesn't even include replacing electronic components that are known to fail such as the height sensors). 2000-2006 Chevrolet Suburban 1500 Air/Magnetic Shocks (x4)- shocks that contain an air bladder or magnets whose dampening capabilities is controlled by the suspension control module. 2000-2006 Chevrolet Suburban 1500 Coil Springs (x2)- Coil springs hold the vehicle up but be careful, they are rated for and designed to work with the rest of the suspension system, so when you change air shocks to passive shocks, then you will need a different rated coil spring that works well with the new type of shocks. 2000-2006 Chevrolet Suburban 1500 Torsion Bar- Adjustable horizontal bar on the front of the vehicle that holds the vehicle off the groundtorsion bar. 2000-2006 Chevrolet Suburban 1500 Shock Absorbers (x4)- a metal tubing filled with gas-charged hydraulic fluid that is connected to the wheel of a vehicle in order to reduce the effects of vertical travel on a rough surface which controls the bounciness, and therefore comfort, of a vehicle. 2000-2006 Chevrolet Suburban 1500 Air Lines- tubes that run from a compressor (air suspension) to the air struts which carry pressurized air to the air shock components in order to adjust the height of the vehicle, respectively. 2000-2006 Chevrolet Suburban 1500 Solenoids (x4)- usually L-shaped, these plastic components connect the electrical connection and lines of suspension components to the suspension control module on vehicles with active suspension. The solenoid regulates the air pressure for each air spring. Solenoids start to leak as they wear out causing the vehicle to sag or to lean. This will cause the ride height sensor to send a signal to activate the compressor in an attempt to inflate the air suspension and level out the vehicle. This excessive work load will eventually lead to total failure of the compressor. 2000-2006 Chevrolet Suburban 1500 Compressor- creates/sends pressurized to active suspension components. When the air suspension starts leaking, the compressor/pump starts working harder to try to keep the system inflated. By the time air suspension leaks down completely, sitting the vehicle on its tires, the compressor will either have failed or be well on its way to full failure. Buying replacement struts and taking the time to install them only to find out the compressor still needs to be replaced can be very frustrating, time-consuming, and expensive. 2000-2006 Chevrolet Suburban 1500 Dryer Assembly- used to keep moisture out of air lines and air springs in order to prevent freezing and internal cracking of these parts. Once air suspension starts leaking, moisture will build-up throughout the air system. Moisture damages the air suspension from the inside. The dryer will need to be replaced in order to eliminate the moisture and prevent any further damage. 2000-2006 Chevrolet Suburban 1500 Suspension Control Module- a computer which is responsible for the operations of the air suspension system and maintaining the vehicle√¢¬Ä¬ôs correct ride height. 2000-2006 Chevrolet Suburban 1500 O-rings- Although they are the least expensive parts of the air suspension, they are responsible for maintaining the seal where all of the air lines connect. Be sure to replace the O-rings when repairing any air suspension system. 2000 Tahoe love the product. I bought front and rear shocks with coil springs. Rides like a new truck again..
Great Service. Great Product. Made in the USA! This kit cannot be beat. Restored a safe ride and eliminated the expensive self leveling shocks! Easily installed with basic tools in a couple of hours. Great instructions. Highly recommend.